Today is the day Frodo destroyed the ring, by way of Gollum, and the day we celebrate the archangel Gabriel announcing to Mary that God desired her to be with child. In honour of both events, here are some posts I’ve previously written. I hope you enjoy. Today I want to continue our conversation about forming a sacramental imagination in children. As I said before, I want to focus on the works the helped form my imagination as a child. The first book on the list, therefore, is J. R. R. Tolkien’s The Hobbit. I am limiting myself to The Hobbit because attempting a brief overview of the sacramental imagination in this book will be hard enough without also delving into The Lord of the Rings and The Silmarillion, or what’s more, the History of Middle Earth series. Therefore, if you read this post and see that I’ve left out Ents, Galadriel’s Mirror and phial, silmarils, etc., you will understand why. As I’ve said on multiple occasions, there has never been a particularly long period of my life where The Hobbit has not featured in it. It is one of the earliest books that was read to me in the cradle and his been my closest companion these many years. 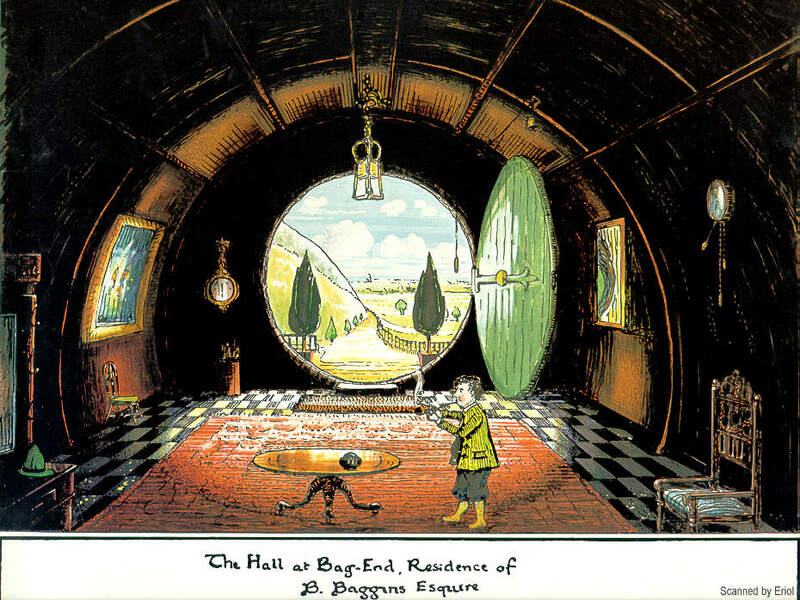 The book, for those who haven’t read it or seen the first two films of the trilogy based on it, is about a hobbit, a creature of about three and half to four feet tall called Bilbo Baggins. Bilbo lives a rather bourgeois life. He’s a bachelor, has a well stocked larder (pantry), doesn’t seem to need to work any longer at the middle age of fifty (hobbits living to 100 as like as not). He doesn’t have much use for anything he can’t see with his own two eyes and anything fantastic he believes in, say dragons or goblins or even wolves, merely frightens him at the possibility of their existence. He is, for all intents and purposes, a rather standard, post-enlightenment, upper middle class gentleman. Then all of a sudden he encounters a wizard and not long after thirteen dwarves who convince him to go on an adventure. Bilbo is meant to represent us in the story in many ways. Even in height he rather matches many of the children who would about his stories. Of course most of them, and us, would not be quite so stolid as Bilbo, bemoaning missing handkerchiefs, desiring pipe tobacco (from experience anyway), etc. But still, like Bilbo, most of us have never seen dwarves or wizards or elves or goblins or dragons or great kingdoms carved out of mountains. If we knew the dangers, I dare say most of us would rather stay home and eat bacon than go attempt to steal treasure from a sleeping dragon. And yet, like Bilbo, we don’t know the danger and so, as he goes on his adventure, we join him, and we, like him, gain something in the end. It is obvious, when you reach the end of the book, that Bilbo has changed. He has encountered goblins, Gollum, a dragon, dangerous elves, rock giants, and more. And yet, he does not leave behind his old self completely. He still loves good food and drink more than treasure; he still dreams of bacon and enjoys throughout his adventures smoking his pipe (the very scene with which the book ends). Yet as he sings his song, ‘Roads Go Ever, Ever On’, as Gandalf notices, he is not the same hobbit he was at the beginning. He has been transformed. The narrator casts this transformation in two different sets of terms. The first is prose versus poetry; the second, Took versus Baggins. In the Took and Baggins dichotomy, nothing is lost. Bilbo is as much a Baggins at the end as at the beginning, but he is a Tookish Baggins or a Bagginsish Took. He still, as I’ve said, loves good food and pipes by the fire, but now his guests are not simply other hobbits, but dwarves, wizards, and even elves. From prose to poetry, however, there is truer transformation. Bilbo takes no part in the songs sung throughout the book, though he is at times moved by them. I think it striking that Bilbo does not, so far as we know, sing until the very end of the book where he not only sings, but sings a song of his own creation and what’s more, his own creation on the spot! Bilbo, the narrator tells us, was never so prosy as he imagined, but at the end he no longer even imagines himself prosy, he is now a poet. I think it is this that helps us form a sacramental imagination, the dual recognition that we need not leave this life behind in commitment to a sacramental cosmos, just as Bilbo must not leave behind Baggins to become a Took. We can still love food and comfort, but now because we know the depth of these things, because now we know with whom we dine for Christ is present at every meal, though much more so and in a different way at one in particular. Nevertheless, the more we give in to the sacramental cosmos, the more we become poets, leaving behind pure prose. Thus, not only how we see the world has been changed, but how we talk about it has been changed as well. This is, in part, what we, like Bilbo, gain at the end of the story, a wider context in which to live our lives and new language in which to describe it. I just came across another video with Alison Milbank and thought I’d share it along with some other Tolkien related things I like. Also, make sure you check out The Tolkien Professor Podcast. Dr Corey Olsen has been doing this podcast for three years now and has provided some excellent insight into both Tolkien’s work and the Faerie tradition. Check out the podcast here. Also, make sure you check out his online Master’s program in English and Tolkien Studies here, called the Mythgard Institute. 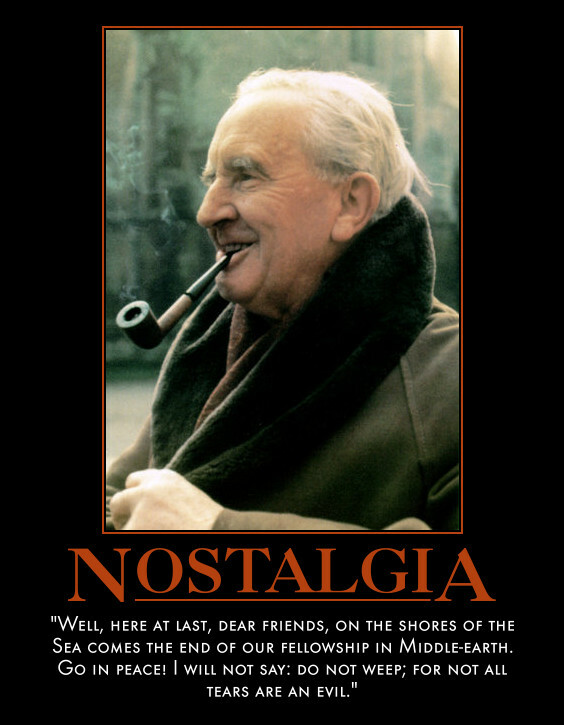 Finally, stop by The Tolkien Professor website and give it a once over. As they say on their website, click friend, and enter. Ok, that’s probably all the Tolkien news from me today. I hope you enjoy. Look forward to a post from me once I’ve seen the film. As The Hobbit: An Unexpected Journey, arrives on the silver screen for all peoples, I thought I would post two videos concerning Tolkien’s excellent work. The first is a video from the intelligent and wonderful Alison Milbank. The second is a video from myself on the first two, and only, so far as we know, two poems/songs that will be featured in the first film. I hope you enjoy and like me, anticipate seeing this film with much joy.